This one I’m still not even sure what went wrong. 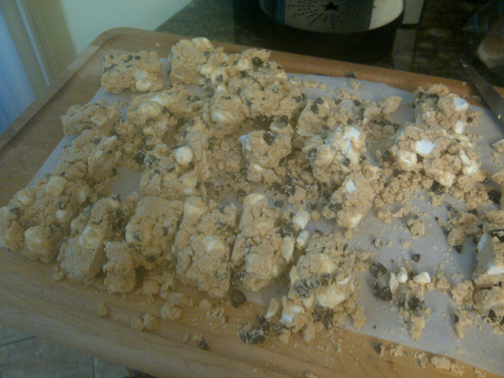 It was supposed to be Avalanche Bark and was a dry, crumbly mess when I went to cut into it. Only the middle pieces remotely held together. I followed the recipe verbatim, checked it twice, I did it all. Other people had reviewed the recipe and seem to have had success. This one is an unsolved kitchen disaster mystery. Do I dare try it again? 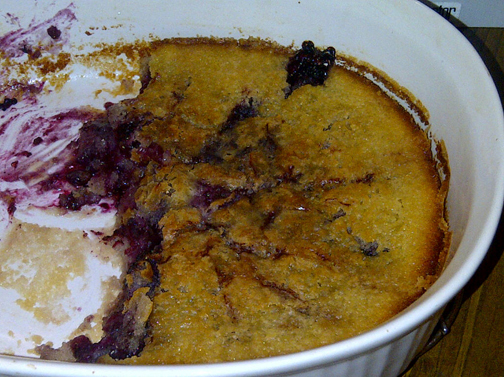 I like to blame this failed Blackberry Cobbler on my oven in my old apartment that I swear was from the stone age. 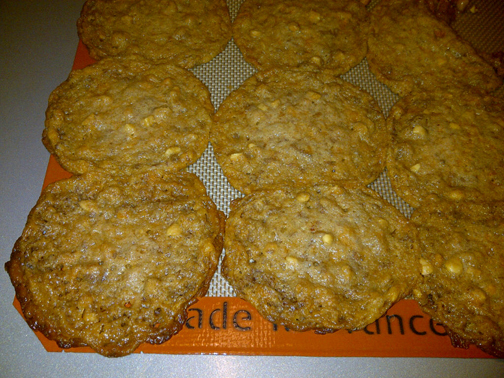 This had self-rising flour in it…..it did not do any self-rising, however. In fact, all it did was turn into a nasty spongy texture on top. It also tasted rubbery. We still ate it, of course. I attempted this again in my oven in my new house (one from this century) and it came out fine. For once, a mistake that wasn’t my own stupidity! You know that part of the directions of a recipe where it says “now add dry ingredients to wet ingredients?” Yeah, I failed to do that. Minor hiccup, I would say 🙂 You would think I would have caught on that the dough was completely wet and sticky and not coming together at all……nope! Not sure where my brain was that day but it was in a far away land. Let’s also blame this one on my old oven which decided on it’s own what temperature it wanted to be at any point in time……forget what I set it at! Anything that needed to rise or puff up in the oven did not rise or puff up! 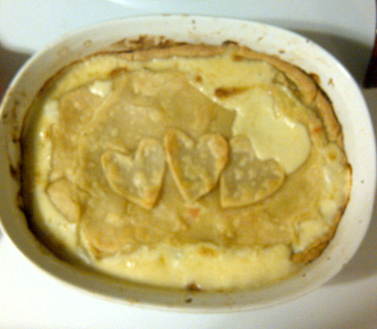 Hence, the gravy seeping through and causing a soggy chicken pot pie crust. It’s too bad, because it would have been so pretty with the hearts, don’t you think? I have NO idea what the heck this was supposed to be but Mr. Wishes walked in the door and his exact words were “What the heck is that? 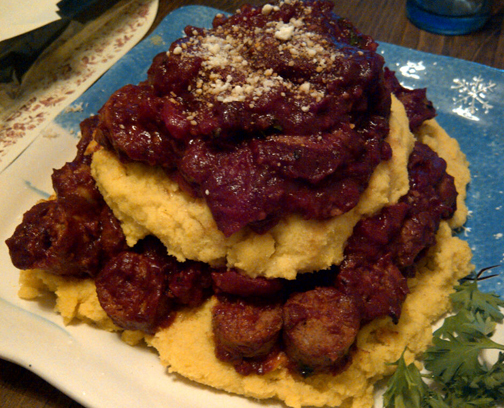 !” Not only did it look scary and unappetizing, but the polenta tasted like cardboard and this whole meal was inedible. I have yet to give polenta another try. I don’t dare. My Honey Banana Bread which I forgot……..you guessed it….the flour!! Banana bread soup anyone? Ughhhh kitchen fails make me get so upset! Like…Michael has to yell at me to calm down because I get so mad and usually cry. Thank you so much for sharing this! I too have had my fair share of dinner/dessert disasters and it is refreshing to be reminded I am not alone! And you are so right about that enchilada ‘soup’ it was hard not to stare at that picture….but it just got grosser and grosser! Thank you for the laugh! Now I am off to brave a new recipe and make Irish Lamb Stew! Let me know how the stew turns out!! Oh my goodness, how I can identify with this post! It doesn’t matter how much you cook, there are always disasters. In fact, I think the MORE I cook the MORE disasters I have… more opportunities, I guess. 🙂 Half the time I don’t have a clue what went wrong. Just have to laugh it off and try something else! Great post! I think you’re right – the chances of having kitchen mishaps greatly increases the more you are in the kitchen! My Avalanche Bars (attempted just last month) looked much like yours, if it makes you feel any better. I still ate the scraps, but they weren’t very photogenic, and not worthy of the pretty cookie trays we were making for the parties we’d be attending. C’est la vie. It’s all a part of the adventure! So glad we aren’t the only ones that make dumb mistakes!! I totally agree! It’s a learning process, for sure. 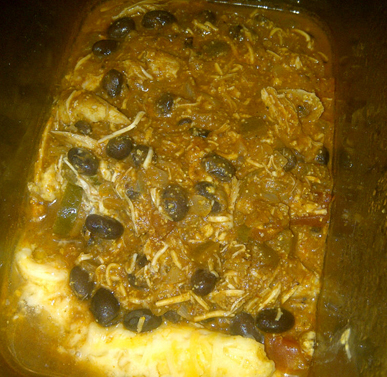 Haha, your “enchilada soup” reminds me of the lasagna my mother-in-law made for my husband’s birthday dinner. We all gave her such a hard time (loving) about her “lasagna soup.” 😉 (Moral of the story: use the correct pan.) I think my most disappointing kitchen fails are when I make something that looks amazing, but tastes terrible or just okay. It’s especially disappointing when it is something I planned to blog about, because then I’m scrambling to produce something else because I don’t feel right about sharing something that I didn’t love, you know? I feel the same way! Sometimes the things I think are going to be great for my blog end up being underwhelming and that’s always such a let down! 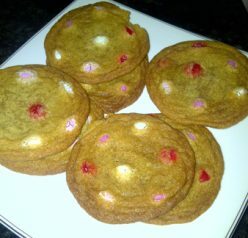 OMG, I have made the cookie sheet cookie. I just told the kids it was a cookie pizza. Squirted a little butter cream frosting on top, cut it into squares, plated and enjoyed. Even had a request to repeat. I LOVE this post! I love that your showing that although all the recipes on this site look amazing, you are human just like every one else and you also have dishes that turn out nothing like you thought they would. I personally cry or just have an crazy attack when something turns out wrong in the kitchen lol glad i’m not the only one this happens too!